Export promotion councils support exporters by providing financial assistance and other service supports to encourage exports. 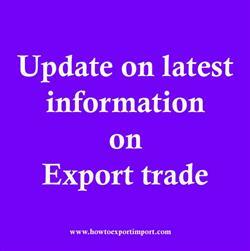 One of the service supports provided by them to exporters is update on latest information on export market trends. How does Export Promotion Council support exporters in updating latest information on export trade? Export promotion councils provides latest happenings on export market to exporters. They also provide trade enquiries to exporters collected from various sources. The exporters are intimated threats and challenges in the international market to sell their export product. Global tenders received from various sources are distributed among exporters of concerned export product.